12. You tend to say 「頑張ります」all the time, no matter how insignificant the task at hand may be. (YES. There's a reason why every non-Japanese speaker knows how to say 「頑張ってね～」. I think I might have to rethink my options a little. a slight incident yesterday reminded me of the need to step back from where i'm headed and take in the Big Picture. we have issues from religion, to me keeping my maiden name, to how we want to raise our children, where we will live and settle. not to mention the smaller things like how i would like a bed and he prefers a futon. oh, and he doesnt want a TV set in the house. i always thought i knew where i was going with all of this. i put up with some very tough times to get to where i am today. for some reason i'm not so sure about the future anymore. maybe it's what's been happening at home of late. maybe it's the fear of not being there when people need me, or because i'm exhausted from looking on the brighter side all the time. i can no longer keep giving without getting something concrete in return. and it just doesnt seem right for me to sacrifice the rest of my years, along with my responsibilities, for something that i try very hard to earn but may never get. i now realise it's not about the time or distance. love does not always save the day because there are mountains that can never be moved, and people that wont ever change. Went to the hospital to visit my cousin's grandmother today. her condition took a turn for the worse and she had to be put on dialysis. it's worrying because there's only so much her frail body can take, and the risk of further complications is very apparent. i am constantly reminded of how transient life is and how fragile people actually are. last week, sam's mom was warded for a spinal cord operation and jac lost her grandmother. it's hard keeping your own emotions in check when you're faced with people who are dealing with the loss or suffering of a loved one. for me, it always triggers the memory of the time when ken's grandmother passed away. it was especially painful because he was living in singapore then, and we couldnt manage to get ken to her side in time. i was woken up one weekday morning at 6am by a phonecall from ken, who had been putting in the night shift at work when his mom had called to say that his grandmother had collapsed at home. they rushed her to the hospital but she had deteriorated so badly by then that she didnt even manage to regain consciousness. i remember rushing to the airport so that i could get ken on the next flight out. everything was full so in the end he had to fly via seoul to okinawa. just when we were about to leave the ticketing counter, his mom called to say that his grandma didnt make it. i dont think i'll ever forget ken's reaction for the rest of my life. in my years of knowing him i have never seen him cry, but he literally fell apart at the news. letting him take the flight home alone was one of the hardest things i ever had to do. ken loved his grandma and was very close to her because she took him in when he was a wayward youth who didnt believe in going to university. i think ken feels that he owed everything to his grandma and her "tough love" policy. he tells me she was very critically injured in a road accident once, but miraculously she survived, except for her muddled cooking skills that saw her come up with an endless slew of near-inedible dishes after her recovery. ken said his was the only grandma with nine lives. until this day, not having ken see おばー for the last time remains one of my biggest regrets in life. My latest obsession is this gorgeous wallet from Marc Jacobs. It's only US$350! Small price to pay for a pretty pink piece of cow! 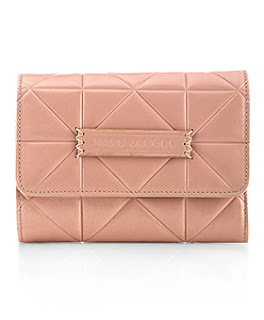 What better way to declare my love for the girly pastel shade than with this? Just let me call Ken now. E heh. I haven't been writing at all these days. a lot has happened since i quit my job, things both good and bad have been coming in from all sides and just keeping up requires quite some effort. but today, just as i was feeling powerless and lost, i found solace in a very comforting embrace from two very loving friends.